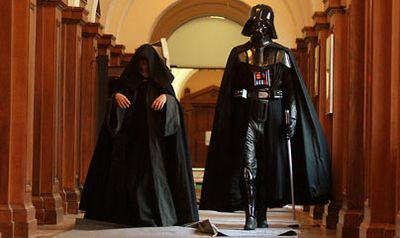 Vader with his attorney and Special Counsel, Emperor Palpatine, walking into the courtroom before trial. Vader v. Vader (1899) 349 Gal.Emp.4th 428 is a landmark legal decision in which the Intergalactic Supreme Court held that Darth Vader, despite his mastery over the Dark Side of the Force, could not exist as two separate people at the same time. As legal precedent, the decision paved the way for Darth Vader's involuntary Lithium treatment for Bipolar disorder and Schizophrenia. The case is also credited with ending Darth Vader's previous, annoying habit of referring to himself in the third person. 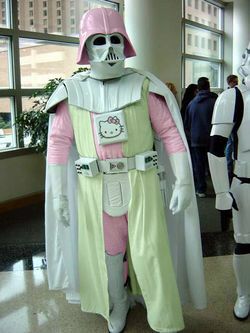 One of Darth Vader's Alter Egos, Darth Hello Kitty. 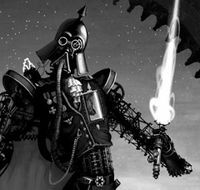 Darth Vader's second Alter Ego, Darth Steampunk. Darth Vader's third Alter Ego, Bat Vader. By 1895 according to the Christian calendar of Earth (which is in a galaxy far, far away), young Darth Vader was suffering from hallucinations of alter-ego Darth Vaders, many of them similar to Darth Vader's appearance, yet starkly different. One such alter-ego appeared in the form of a "Hello Kitty" Sith Lord, whilst another was a strange combination of Batman and Darth Vader. The Dark Lord was unable to consolidate these diverging identities, and as a coping mechanism began speaking in the third person. Imperial Officers such as Admiral Ozzel and Captain Piett testified at the ultimate trial to overhearing comments spoken by Lord Vader such as, "Darth Vader's failed himself for the last time," and "Darth Vader doesn't know the power of the Dark Side." The most damning testimony at trial came from Boba Fett, who swore under oath that he had heard Darth Vader say, "Darth Vader is Darth Vader's father." Darth Vader refused to admit to the psychological strain he was suffering under and instead determined to seek redress through the intergalactic legal system. Bringing a civil action to quiet title to his name, Darth Vader filed the case that infamously came to be known as "Vader v. Vader." Through the case, Darth Vader sought a judicial declaration that he was the one and only Vader. 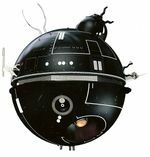 He imagined legal adversaries such as Darth Hello Kitty, Bat Vader, and Darth Steampunk (all of whom are pictured in this article as described by Vader himself during his trial testimony). He even convinced his mentor, Darth Sidious, to act as his lawyer and advocate for his version of events, i.e., persecution at the hands of a series of (imaginary) evil Sith Lords. Vader wore his "Sunday best" to the sentencing hearing, but did not receive any lenient treatment. 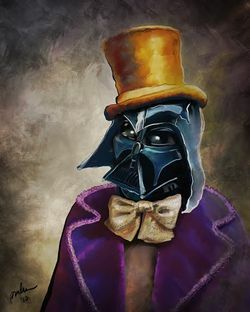 A scene from one of Vader's psychedelic "trips" while undergoing involuntary administration of psychotropic drugs. Darth Vader was shipped to a clandestine rehab center on the fourth planet of the Hoth System where he was administered a constant regimen of Lithium and Zoloft by Imperial interrogation droids. After seven months in treatment, he no longer had "bat talks" with an alter ego of himself, and admitted that he had been the only party (both plaintiff and defendant) in his lawsuit of Vader v. Vader. His mind sound at last (except for the twisted hatred that comes with the Dark Side), Darth Vader was released from rehab on his own recognizance, but had to pay a fee of $15,000 Imperial Marks to the Intergalactic Supreme Court as a fine for bringing a false trial. The case left a legacy of widespread misuse of Imperial interrogation droids. The case also had wider repercussions. Prior to the decision, Imperial Storm Troopers were not lawfully allowed to utilize interrogation droids to "soften up" suspects and witnesses. After the precedent allowing even Darth Vader to be compelled to submit to involuntary drugging, however, all of the subjects of the Galactic Empire became subject to involuntary civil commitment proceedings, often involving convoluted "drug cocktails" mixed by the bartender from the cantina on Mos Eisley. Never before or since has there been a legal decision of such wretched scum and villainy as Vader v. Vader. ↑ The landmark case Gollum v Smeagol (transcript available in spidery handwriting on request) has no legal standing here. ↑ Id wasn't involved at he was on holiday at the time of the transition. ↑ Gloria Vader denies she was ever sick in a Transit (van). This page was last edited on 19 December 2013, at 04:02.